We are able to transfer all standards of Betacam SP from the US (NTSC), UK (PAL) and (SECAM). The Betacam SP is a mature format that has proved really reliable over the years. It is still too early to tell the long term issues with the later Betacam SP tape formulations and the components in the machines. The early BVW series machines are however starting to get problems with certain components in their operating boards, these are fairly easy to resolve. A further problem arises from Sony’s policy of only supporting their professional products for ten years, meaning that key spares such as rotary head drums will not always be available, that will make it harder to maintain working machines in the future. As Sony was being humiliated in the VHS vs Betamax war, a similar war was being fought in the professional video arena with very different results. Betacam, launched in 1982, was the first professional video format in the Sony Beta range. In stark contrast to the failure of Betamax in the home video market, Betacam was a great success. In the professional market, quality and reliability are paramount — unlike the consumer market which is more concerned with recording times and availability of movies. Betacam was a high-quality format and attracted a lot of attention amongst professionals. The original Betacam cassettes were basically the same as Betamax. The difference was that Betacam used component video rather than composite, and recorded at a much higher tape speed. Betamax and Betacam tapes were interchangeable (unlike the later Betacam SP tapes). Betacam was a relatively short-lived format, replaced by the next generation of the Beta family: Betacam SP. Betacam SP was launched in 1986 and went on to become the most successful general-purpose professional video format of the 20th Century. 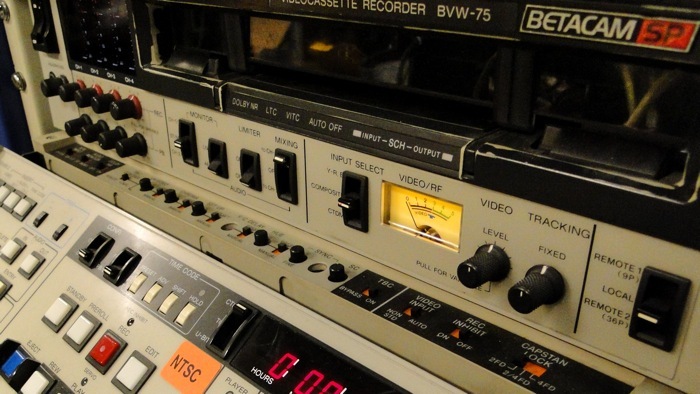 Betacam SP was adopted as the standard format for field work such as ENG (electronic news gathering), but was also good enough to be used for edit mastering. Every respectable studio had Betacam SP capabilities. The ‘SP’ stands for ‘Superior Performance’, which was achieved by using a metal-formulated tape instead of oxide. Horizontal resolution was increased to around 360 lines. Contact Us now to preserve and access for analogue Betacam tapes.